The ProFX8 offers a complete and truly professional feature set, perfect for solo performers, small performing acts or any small venue that needs it all, without the hefty price tag. There’s even USB I/O for recording the set. The “Pro” in ProFX stands for Pro. Professional tools, rugged build quality, small footprint…everything you need. The ProFX8 is fully stocked, featuring four Mackie high-headroom, low-noise mic preamps, 3-band EQ, a built-in DI for direct connection of a guitar or bass, integrated effects, precision 7-band GEQ and more. All of these great features are housed in a rugged enclosure, in true Mackie “Built-Like-A-Tank” tradition. The ProFX8 has the right set of great-sounding tools to make your gig sound better and run smoother. Your job is to make things sound good. Maybe you’re a solo performer playing covers at a Vegas hotel bar. Perhaps you have the honor of being the “engineer” of your band and not only do you play bass, you’re also in control of the mix. No matter what the situation is, you need the tools to get the job done perfectly each and every show. High-headroom mic preamps with great-sounding effects, channel EQ, a built-in DI, plus precision GEQ to tune-up the room or monitor mix. The ProFX8 comes with all these features—it is truly the perfect live sound toolbox. The all-new RMFX™ (Running Man FX) 32-bit effects processor brings “Gig Ready,” useable effects to your mixes. Why scroll through hundreds of bizarre effects, like “ghost ambience?” Yeah, like anyone even knows what that means. Or how about winners like “delay+phaser2”, which you’ll never use in a million years. Those other mixers will leave your fingers raw from all the scrolling you have to do. The RMFX™ processor features 16 solid FX that are known for their utility and usability. Small, medium and large room reverbs with a mix of a warm and bright characteristics puts your mix in the right space. Simple, rich choruses and an array of practical delays enable you to create professional mixes without requiring a two-hour sound check. Basically, we’ve delivered the choicest parts of a full rack of gear, right at your fingertips, that is easy to master, allowing you to look and sound really good at your next gig. Really, really good. With all the right tools for the job, the ProFX8 allows you to create memorable mixes, but even with all those features, portability is paramount and you can’t be burdened with lugging around additional equipment. No worries, integrated USB I/O takes the pain out of recording. Just connect the ProFX8 to a laptop, start up your included copy of Tracktion 3 Music Production Software (or almost any DAW software out there) and you can record the whole mix. You can even stream music from your laptop during breaks. Once you get home, record more tracks or use the ProFX8 to playback some tunes during the next BBQ. Unless you’re a vegetarian…not that there’s anything wrong with that. The innovative “USB Thru” switch allows for an impressive live/recording setup when using performance software like Ableton Live or Reason. When gigging, stream the output of your performance software (or iTunes, for that matter) into the ProFX8. Combine that signal with anything plugged into the mixer, and send the whole thing back to the computer for recording. Archiving your integrated live performances has never been easier! Mackie is known for building mixers that are “Built-Like-A-Tank” and the ProFX8 is no exception. All of its tender bits are securely encased in a solid steel chassis. No only that, the impact-resistant side pieces are made of ultra-tough ABS, adding extra protection where it is most likely to fall…not that you drop things. Simple is better. A utility mixer like the ProFX8 is an integral part of a ludicrously simple Mackie PA system that sounds great. The only choice is whether to go “active” or “passive” with your loudspeaker setup. The legendary quality of Mackie loudspeakers combined with the utility of the ProFX8 is a lethal combination that will suit just about any size venue. Just add enough speakers, and you’re golden. The ProFX Series Compact Effects Mixers strike the perfect balance. They offer all the right tools to get the job done well, sport the popular compact footprint that Mackie is known for and are also the most budget-friendly of all the Mackie sound reinforcement mixers. Our competition either doesn’t have the expansive feature set of the ProFX Series, or they simply will not survive the test of time. 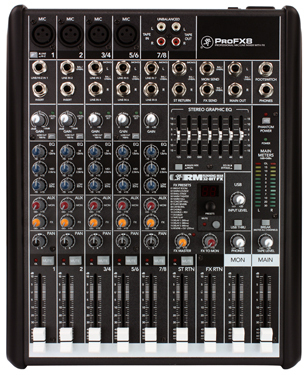 You are investing in your mixer and the ProFX will be there for you at every gig, ready to roll.